The global hedge fund sector finished 3Q2010 on a high note as the Eurekahedge Hedge Fund Index delivered a strong 3.37%1 return for September. A surge in risk appetite amid upbeat corporate earnings estimates and a stream of positive economic data led to rallies in the underlying markets. The MSCI World Index advanced 6.74% in the month. Newly revealed data puts the revised net asset flow figure for August at US$14.7 billion while net subscriptions for September were even higher at US$15.61 billion. This brings the total size of the industry at US$1.59 trillion, a 23-month high. While asset flows have started to pick up as predicted by Eurekahedge analysts, performance-based gains accounted for a massive US$24.3 billion increase in industry assets in September. 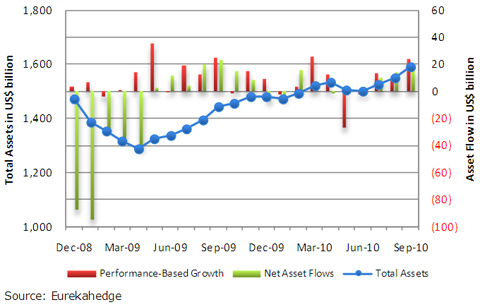 Figure 1 shows the monthly asset flows across the hedge fund industry since December 2008. Hedge funds attracted US$30 billion over August and September based on newly revealed data, taking total assets to just shy of US$1.6 trillion (surpassing November 2008 total AuM). UCITS III hedge funds continued to attract capital to the tune of US$3 billion in September 2010. Hedge funds witnessed their best monthly returns in 16 months, up 3.29% in September 2010. All regions and strategies posted positive returns for September 2010. Larger hedge funds (AuM > US$500 million) outperformed smaller funds, up 6.04% YTD. 1Based on 61.43% of the funds reporting the NAV for September 2010 as of 15 October 2010.